Operating at 540rpm, the large fly wheel with built-in shear pin maintains constant momentum to the baler’s main working parts. 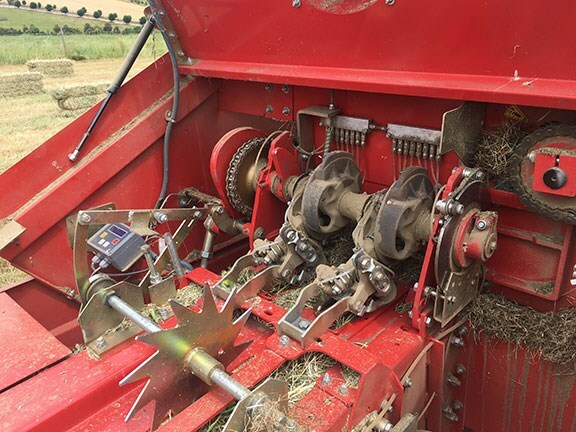 On the face of it the Enorossi Enopack 900 is like any other small square baler, but it soon becomes apparent that this is a next-level machine. As the sun beats down on a calm November afternoon in the south-west Victorian town of Winchelsea, Noel Castle and his wife Glenys are flat out baling and carting hay. 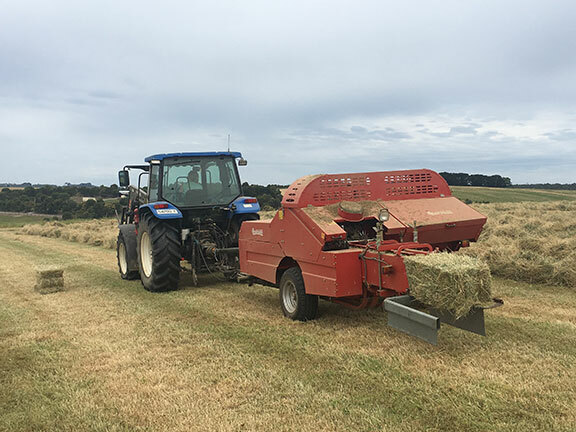 Glenys is on their new Enorossi Enopack 900 small square baler and Noel is in charge of carting duties aboard his old but reliable New Holland 1035 self-propelled bale wagon. It’s a race against nature as threatening storm clouds start to build in the west. As I drive into the paddock to witness the new baler in action, I am instantly transported back to my late teenage years, back to the days when a young school kid could earn enough money carting hay during the Christmas holidays to keep him in pocket money for the rest of the year. Suppressed memories of blisters, sunburn, sore eyes and stale sandwiches packed in an old foam Eski flood back. I seem to remember ripping the knees out of every good pair of Levi jeans I owned, then having to spend half of my hard-earned income replacing them. Little did I know that 30 years later in 2017 every teenager would be paying a hefty sum for brand-new jeans that already had the knees ripped and frayed. Go figure! And I distinctly remember struggling to understand the laws of nature. I grappled with the mystery that no matter what direction the truck was travelling, the wind, without fail, always blew directly in my face. The words ‘Italian made’ instantly make me think of precision-made equipment. It’s not necessarily about its appearance but more about the smooth symphony created by the rhythm of hundreds of moving parts all working together in perfect unison. That is the exact impression I received the moment I witnessed the Enorossi Enopack 900 in action for the first time. The stroke of the plunger inside the chamber creates a perfectly timed beat. The needles and knotters chime in with timed regularity and the 1.8m tined pickup provides constant material to the main performers. It is this perfectly performed harmony that produces an optimum-shaped and -weighted bale every time – each one exactly the same as the last. 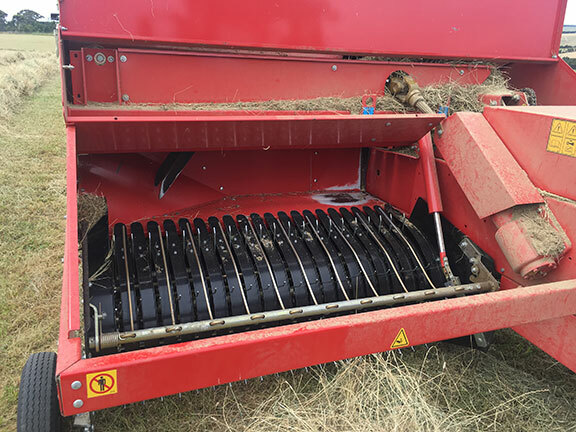 So it goes without saying that my first impression or gut feeling about the Enorossi small square baler is nothing short of excellent. At first glance it seems that nothing much has changed in the way of small square baler design. 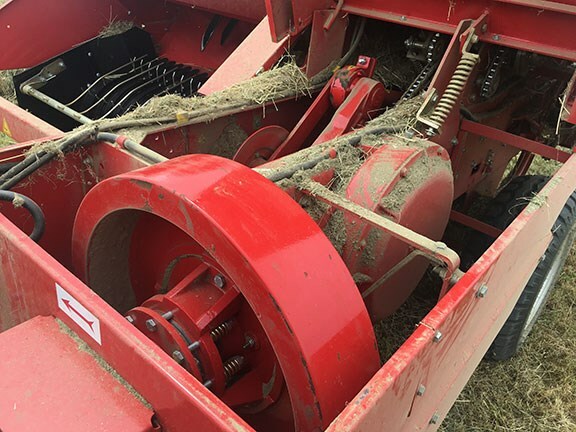 The heavy fly wheel on the Enopack 900 is PTO-driven, the grass is fed into the front of the baler by a tined pickup, swept into the chamber by twin forks, cut and compressed by the plunger, and tied before being spat out the back ready for the dreaded job of hay carting. But while everything seems unchanged from the early-model balers from the 1950s and ’60s, a closer inspection reveals that while the basic design is similar, the individual features have been improved dramatically. The new Enorossi Enopack 900 has adopted electronics, hydraulics, automatic lubrication and cleaning mechanisms to bring it into line with modern machinery. 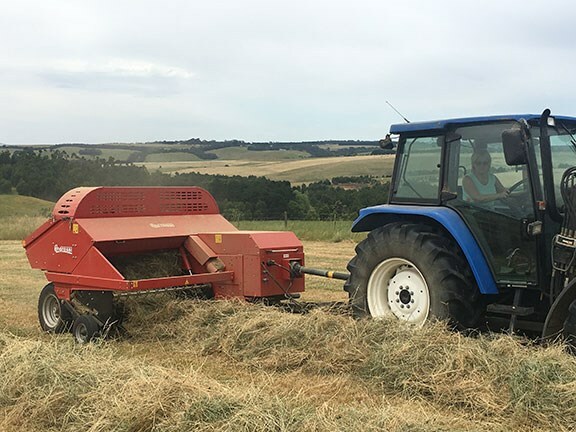 Compared to the old New Holland 56 I used to operate years ago, the Enorossi 900 is faster, quieter, smoother and produces a better bale in terms of consistency and density. I can’t help myself; as soon as I get out of my car I walk straight up to one of the freshly made bales to find out if it passes the quality inspection. Every farmer, or ex-farmer, checks a new fence line for straightness, a plough furrow for even depth and a hay bale for density and weight. It’s just what we do. The perfectly shaped bale passes the pickup test with flying colours. The 36cm-high, 46cm-wide and 120cm-long Enorossi bale is perfectly straight, indicating equal pressure has been placed on both sides of the chamber. The cut side of the bale shows only beautifully sliced stalk ends so the knife must be sharp and doing its job properly. The strings are tight but there is enough space to slide my fingers under. Every bale is firm and dense and a bloody hell of a lot heavier than I seem to remember. I repeat the test a number of times and every bale is exactly the same which is critical when building a good quality stack. There is not a broken or bent bale to be seen so the knotters are working perfectly as well. The new Enopack 900 has a 180cm-wide pickup with flared edges, and a handy addition is a hydraulic lifting arm. This allows the operator to continually adjust the height of the pickup to suit the conditions without leaving the comfort of the cabin. 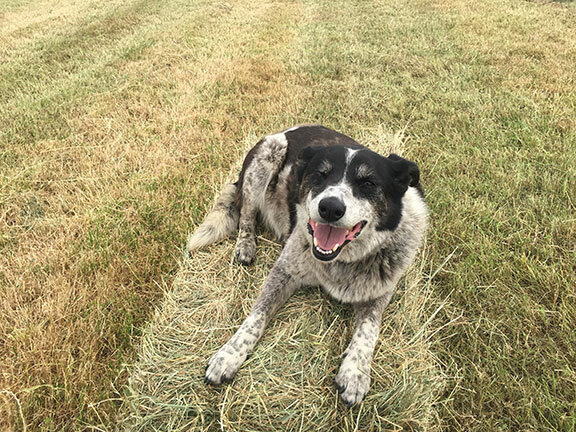 The smooth-running tined pickup gathers in the windrow very efficiently, barely leaving a single blade of grass behind. Dual heavy-duty sweeps work in perfect harmony with the plunger dragging hay across into the chamber in between plunger strokes. The plunger operates at 93 strokes per minute but even at that speed continues to run very smoothly and doesn’t rock the tractor back and forth like the older balers used to. Bale density is one of the few features that have remained a manually adjusted setting. 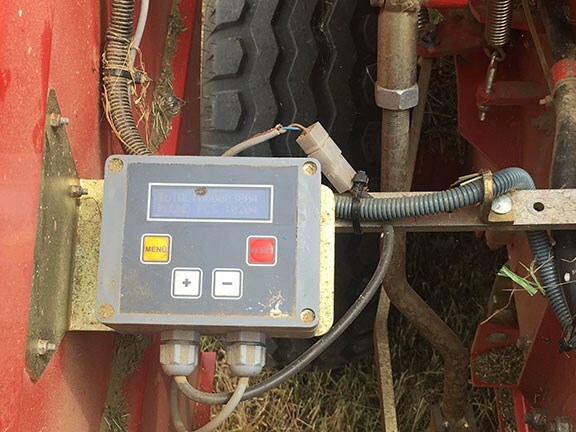 The bale density can be altered manually by using two adjusting springs, which allows the operator to choose the pressure on the bale depending on his or her needs. Winding down two levers at the rear of the bale chamber creates more pressure on the bale, thus increasing the bale density and weight. The dual knotters have changed little over the past 50 years but a few handy inclusions on the Enopack 900 help maintain proper performance. An automatic lubricating device guarantees just the right amount of oil is applied to the mechanism. From memory, too much or too little oil on the knotters can greatly hinder their proper performance. 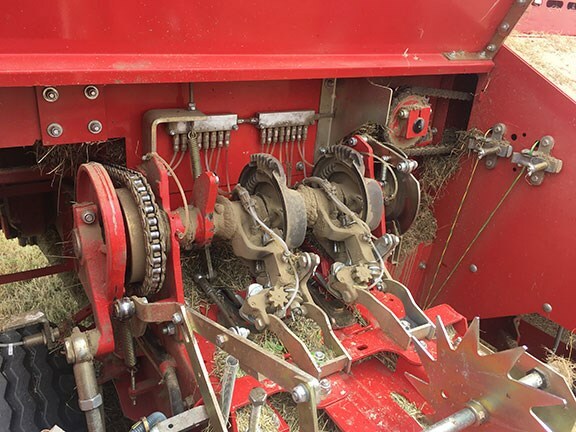 An electric blower fan prevents dust and chaff building up, which can also hinder the knotters effectively tying off the bales, and an optional light kit mounted to the baler directs light over the knotters when baling through the night. An extra adjustable pneumatic wheel mounted to the rear of the baler is a safety device installed to protect the pickup. It prevents the outside wheel of the baler from dropping into a hole which would cause the pickup to smash into the ground. 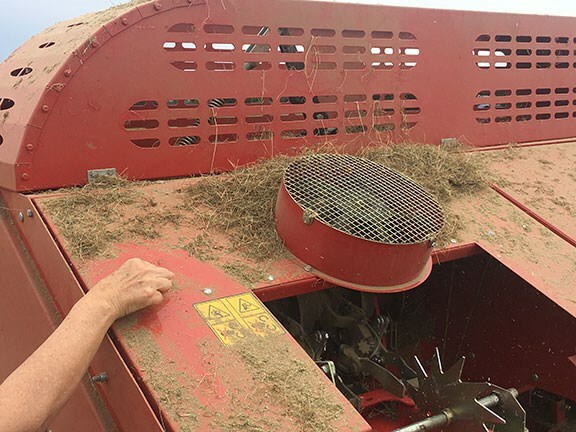 Small square balers are still getting heaps of work maintaining supply into the horse, stud stock and hobby farmer market, not to mention baling up straw for the nursery industry to sell as mulch. If you’re working in this space and need a well-designed piece of equipment then in my view you can’t help but be onto a real winner with this Enorossi Enopack 900. I am definitely a fan.